ATAL Engineering Group (ATAL) is a well-established electrical & mechanical, IT and environmental engineering group, serving customers in Greater China and around the world. As a forerunner and reliable engineering company, we need a reliable, efficient and secure communications platform to facilitate safe and quick communications among staff. 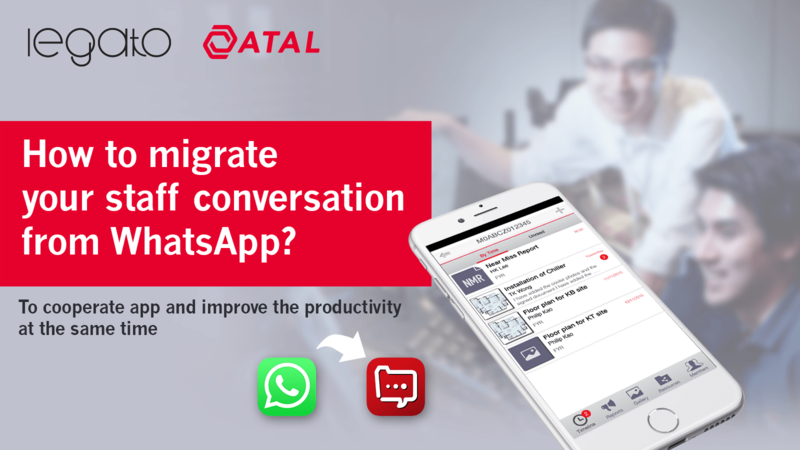 The customised solution – “ATAL Project Assistant (PA) Mobile App Platform” allow staff’s conversations directly migrate from Whatsapp to the PA App. Confidential and Sensitive information can be protected as the organisation no longer relies on the third party communication tool. All contents from the app can also automatically generate as any forms of supporting documents. Company will not require multiple back and forth email or official reconfirmations and hence increase efficiency. Productivity is therefore expedited with the mobile management of accessible reports, pushes, scannings, tags, galleries and commentary. Legato developed this customised project assistant platform for our client – ATAL. If you got an idea in mind, please let us know and we will work this out together.